In our January email, we observed that the closing of our former neighbors, North End Butchers, has led us to engage in some self-reflection about our identity and how to offer a set of products and particular services that will be appreciated by our customers and the prospective customers in our community. Among those identities that we embrace is as an independent, locally-owned shop. We think that dovetails with Vermont’s independence and rugged individualism (not that Frank and I could be described as rugged). We also have curated a portfolio of producers that, based on our experiences with them, represents those same characteristics. There seems to be a real bifurcation of producers within the wine world, either massive conglomerates with numerous wineries under their umbrella of labels, including some industrially-designed and manufactured brands, versus the smaller (often minuscule) family-owned wineries or farms that produce wines unique to their place and cultural practices. That’s more the rugged individualism that we associate with Vermont, but that we can identify and connect with others far beyond our Vermont boundaries. Our next two tastings showcase these small producers. On Saturday, March 10th, Kevin McKenna of LDM (LouisDressnerMcKenna) will lead a tasting of natural wine producers from France. You can read more about how LDM selected the growers they represent at the link above. What unites them all as a group is their commitment to make wines that are “original because they are honestly crafted.” Doesn’t sound so radical, does it? In the context of technologically-derived applications to increase yields and ensure crops, and the second-wave innovations to engineer flavors and textures that sell, making wine from what nature gives becomes much riskier. To cite an authority quoted more frequently lately, “in a time of universal deceit, telling the truth is revolutionary” (George Orwell). In wine terms, that means letting the stamp of place shine through and accepting vintage variation. On Saturday, March 24th, Drew Robinson will highlight some of the exciting new producers shaking things up in California, though I think we’ll have to include a couple of now-revered beat and hippie-generation seniors who have always followed the beat of their own drums. Because of your interest in these kinds of producers across the wine world, Windham Wines’ selection of wines reflects this transparency, giving you the power to make consumer choices consistent with that value. Robert Joseph, former wine write for the Sunday Telegraph reminds us that our consumer choices matter. “Maybe this industry holds no future for thousands of grape growers with small plots of land, but I’d like to think that, between us, we can help at least some of them to survive and to preserve winemaking communities that have existed for generations” (Meininger’s Wine Business International). We look forward to seeing you soon. We appreciate the effort you make to shop with us. Every bottle counts. The wine clubs are a “go.” We have two clubs: Terroir which is an anything goes option– sparkling, white, ros, red; and Vineyard, an all-reds focus. The inaugural voyage of each has been launched. The second round of six for the year will be available in April. You can still join in. The great thing about these clubs– you don’t need sponsors, don’t need approval by the other members, no interview of financials by the board– just wine curiosity and the $60 fee every other month from April through December for the remainder of our pilot year. An example of one of the wines offered in the first Vineyard Club is available to peruse on our website. Give us a call at the shop to join (802) 246-6400. The tasting team had gathered informally (which is to say, per chance) at the shop when a wine rep showed up with this beauty. It was thumbs’ up all around. From the Roccafiore Winery in Umbria, the white is a blend of 75% Grechetto, 25% Trebbbiano Spoletino. We found this wine to have a beguiling, playful set of aromas and flavors from fruit (grapefruit, apple) to floral (but just haunting, not overt) and herb (vague spearmint, fresh parsley). The palate was fresh, crisp and this is where playful came in. It teased and required second sips all around. Delicious, delightful new addition to Windham Wines. We anticipate this wine at the table for our Easter repast. it used to be such a great pleasure for us to visit André and to tour the vineyards with him. There was so much love and devotion, such an intimate relationship to the land. The first time we went he took us to a hill overlooking the town of Minerve to view the gorges and canyons surrounding that famed city. Andr told me there was nothing like that in America but I told him he was wrong, that we have beautiful sites and beautiful natural settings. Andr said, where do you have a view of nature that has been cultivated by man in much the same way for the past ten or eleven centuries? He had a point. The Minervois is 50% Carignan, 40% Syrah, 10% Grenache, from 50+ year old vines. It shows dried fruit (cherries, raisins) and molasses on the nose, with some resin and eucalyptus lift. The finish is great– the fruit lingers but the length is driven by that resinous, slightly baking spice quality that must come from these old vine Carignan vines. Bodegas Olivares Altos de la Hoya is a blend of 90% Monastrell (Mourvedre) and 10% Grenache. The vineyard is situated at the highest elevation in the Jumilla D.O.– 825 meters (2700′). It is also home to some of the oldest pre-phylloxera, un-grafted Monastrell (Mourvedre) vines in Spain. Sandy soils allowed the vines to survive the phylloxera epidemic. To ensure the survival of these old vines (about a century old), the family uses “marcottage” propagation in which roots are “coaxed” from the branches of existing vines by taking a branch of an adjacent vine, guiding it to the ground, encouraging it to sprout roots. It remains connected to its “mother” vine until the roots are strong enough to support the new vine. It is a slow process, taking years, but it ensures the continuity of the original vines. We offer light food with our tastings. Unless otherwise noted, there is a $30, plus tax, tasting fee. Since we cater the food, and we have quite limited seating. Please call us at (802) 246-6400 to request reservations. Thank you to The Porch Too, and Gretchen Hardy in particular, for catering the food and tailoring it to our wines. Kevin McKenna, one of the partners of LDM, is our guide for a journey through the French countryside. LDM has honed a portfolio dedicated to bringing authentic, in Joe Dressner’s lexicon– “unspoofulated” wines to the US. Kevin has been part of that effort since Louis/Dressner was formed, first as a buyer for Astor Place in NYC, then after accepting the challenge of making Louis/Dressner a national importer, now as a partner of LDM. Kevin spends several months each year visiting the winemakers he represents. As Kevin observed to Eric Asimov in 2011, “[i]t’s always been about the winemakers, how they work and their vision.” Kevin will bring those winemakers to us– their stories, places and cultural practices, as we experience them through their wines. Pictured to the left is Marie-Pierre Ich,of Chateau d’Oupia, in Minervois. We’ll be sampling one of her wines, the Minervois “Tradition,” from organically-farmed, old vines (50+ years) that are given the opportunity to express their terroir. 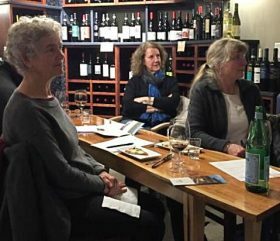 As Jon Bonne, former wine writer for the San Francisco Chronicle, observed the California wine industry is changing. There are now lots of “young, innovative producers who are rewriting the rules of contemporary winemaking,” who are committed to producing wines that express the uniqueness of California’s terroirs. Drew has brought many of the wines from these young lions to Vermont for us to enjoy. He knows the people, knows their stories, knows their wines. Join Drew for a taste of the new California. So many of you have been to Portugal and, after your trips, come in to see what we have. 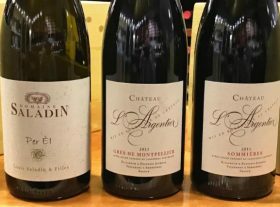 We are finally getting access to some of those wines that you had the opportunity to try while there. Ali Cheevers will be our guide as we enjoy a wine tour of Portugal. As always, food pairings by Gretchen Hardy, of The Porch Too. Also, whenever we are there!